A month before the start of the financial crisis, the Bank of England was apparently unaware of the impending danger, new documents reveal. In a unique insight into its workings, the Bank has published minutes of top-secret meetings of its governing body, the Court, between 2007 and 2009. The minutes show that the Bank did identify liquidity as a "central concern" in July 2007. However no action was taken as a result. The documents show that the Bank also used a series of code names for banks that were in trouble. Royal Bank of Scotland (RBS) was known as "Phoenix", and Lloyds TSB as "Lark". Following publication, Andrew Tyrie MP, the chairman of the Treasury Select Committee, was highly critical of some of the Court's non-executive directors. He said they had failed to challenge senior executive members, like the then governor, Mervyn King, whom some accuse of failing to prioritise financial stability. "The minutes show that during the crisis the Bank of England did not have a board worthy of the name. This mattered. And it still matters," said Mr Tyrie. 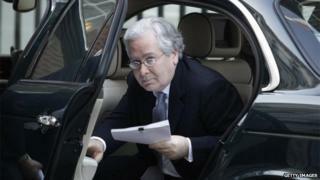 John McFall, chairman of the treasury select committee at the time, told the BBC: "They all missed the wider picture. "They missed the interconnectedness of the whole financial system...when Lehman went down it was a real catastrophe." The minutes show that in July 2007, the Court - akin to a company board - spent time discussing staff pensions, open days and new members of the Monetary Policy Committee. Members heard that the Bank was working on a new model to detect risks to the financial system, but there was little suggestion of any impending trouble. Less than a month later, on 9 August, the French bank BNP Paribas came clean about its exposure to sub-prime mortgages, in what some believe was the start of the financial crisis. Six weeks later, despite some turmoil in financial markets, Court members were told to have confidence in the triple oversight of the Bank of England, the Treasury and the then Financial Services Authority (FSA). "The Executive believed that the events of the last month had proven the sense and strength of the tripartite framework," the minutes asserted for the 12th September, 2007. The next day the banking crisis began in earnest. On that day, 13 September, 2007, members of Court were called to an emergency meeting, just as the BBC reported that Northern Rock had applied to the Bank of England for a rescue loan. Since the news was no longer secret, thousands of customers were in the meantime queuing outside Northern Rock branches to withdraw their money. By then the minutes show that Court members were in no doubt about the risks posed to the economy by the failure of Northern Rock. "Both the Bank and the FSA were in total agreement that if Northern Rock was allowed to fail it would create serious economic damage," the minutes record. Members expressed concern that if Northern Rock was not rescued, there could be a "domino effect" on other institutions. By November 2007 the Bank was using code words for other banks that were in danger of collapse - in an attempt to maintain confidence in the banking system. In discussing a potential rescue for Alliance and Leicester - known as "Tiger"- it said the Bank's offer of £3bn of emergency funding should remain confidential. "It was emphasised that there needed to be considerable secrecy about this facility," the minutes record. Royal Bank of Scotland: "Phoenix"
Publication of the minutes was welcomed by MPs on the Treasury Select Committee. However Andrew Tyrie MP, the Committee's chairman, said they showed that members of the Court had done a poor job in challenging the executive. "Even when questions were asked by individual non-executive directors, the executive usually presented a unified front to the Court, apparently rendering it of little or no use as a forum for creative discussion and constructive challenge," he said. "The non-executive directors appear to have done little thinking of their own about financial stability and to have added little or no substantive value to the Bank's work on it," Mr Tyrie added. He also said the members should have done more to challenge Mervyn King's view that the Bank's main purpose was monetary policy, rather than financial stability. He said they had merely acted as "cheerleaders" for the executive's views. The make-up of the Court has since been changed, so that it now includes no executive directors. Rules on any potential conflict of interest have also been tightened.